Been thinking of taking up cycling? More people are starting to take up cycling as a past-time and mode of transport. In some cities around the world, cyclists even outnumber drivers. Here are just a few reasons to get on your bike and start pedalling. Cycling is a great cardiovascular activity that can improve the health of your heart and lungs. It’s also great at building muscle in your quads and toning up your legs. If this wasn’t enough, cycling is also great for the health of your joints and is thought to ward off diseases like arthritis later in life. All in all, it’s the perfect activity for keeping your body healthy and in shape. Not only is cycling good for the body, it’s also good for the mind. Psychology Today reference several studies that have shown cycling to be beneficial for our cognitive health, improving our memory and reasoning. Cycling is also a great stress-reliever and can be great at fighting the likes of depression by flooding the body with feelgood endorphins. In fact, many people that commuted to work via bicycle found that they arrived at work feeling more alert and ready to take on the day. Taking up cycling could save you a lot of money if you’re the type of person that cycles everywhere. By replacing local car journeys with cycle rides, you could save huge costs on fuel whilst also stopping your car from wearing out as fast, prolonging costly repairs. You can buy quality bikes for cheap from sites such as Bikes 2U Direct. If you’re worried about getting your bike damaged or stolen, you can always look into insurance from companies like Velosure. Learning to repair your bike yourself could also save costs on bike maintenance. If you walk everywhere locally, cycling could help to speed up journeys whilst still giving you the fresh air and exercise that you’re after. 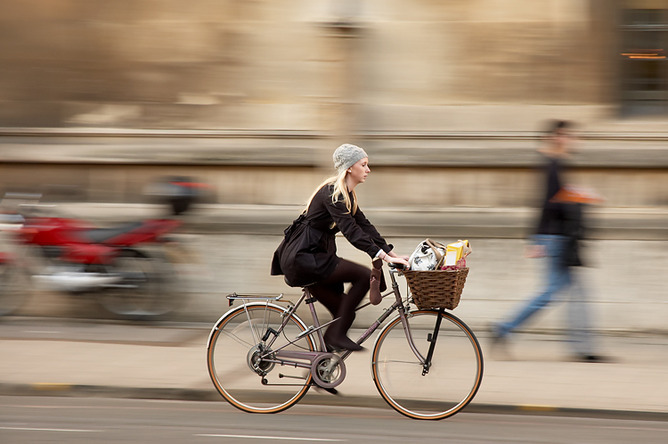 On average, cycling is three to four times quicker than walking. Many cities are now becoming bicycle-friendly with special lanes for bikes, however you still have the advantage of taking alleyways and cutting through parks. You can even add a basket or trailer to your bike for helping to carry shopping. Cycling also creates few emissions – in fact the only time a bike is going to make a real negative impact on the environment is during manufacturing. If you’ve been wanting to live a greener lifestyle, cycling could be the mode of transport for you. You can even buy bicycle lights that are powered by your pedalling or alternatively solar powered so that you’re not even having to use batteries. The Cup of Miracles & Pancake Recipe. I love cycling! One thing I learned when I worked in France though – you definitely don’t want to do it while drunk.